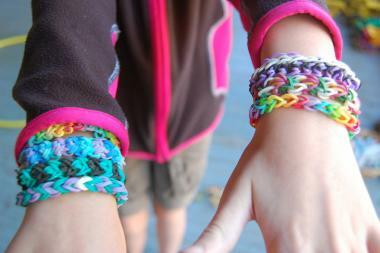 Kids make Rainbow Loom bracelets using tiny colored rubber bands. The toy is wildly popular, but it was so distracting that Park Slope's P.S. 107 recently banned it. The bracelets however are still allowed at school. PARK SLOPE — Wildly popular Rainbow Loom bracelet-making kits are creating such a distraction at a Park Slope school that the principal has banned them. "It's an addiction," said P.S. 107 principal Eve Litwack, who recently turned the school into a no-loom zone. "It was like the kids couldn't live without it. It was just getting to the point where it was really crazy." Rainbow Loom bracelets are still allowed on school grounds, but not the weaving kits, which kids use to quickly make colorful bracelets out of tiny rubber bands. The DIY fad has swept the nation in the last year, but it seems to be creating problems for educators. P.S. 87 on the Upper West Side recently outlawed the bracelets because they were causing fights. That wasn't the case at P.S. 107, but kids were developing an obsession with the toy, Litwack said. Some started showing up for morning line-up toting Ziploc bags stuffed with thousands of rubber bands and "tackle boxes" full of the bracelet-making equipment, Litwack said. On the playground during recess, students were feverishly looping the bracelets instead of running around or playing kickball. While the creative hobby gives kids a break from staring at iPhones and video games, Litwack said she was forced to outlaw the looms when the trend proved so irresistible that first-graders were weaving the bracelets inside their desks when their teacher's back was turned. "When a teacher says it's interfering with what she can do in the classroom, it's just not healthy," Litwack said. In some cases, students were teasing each other about who had the Rainbow Loom kits and who didn't, leading to worries about "haves and have nots" at P.S. 107, which is on Eighth Avenue and 14th Street. The kits cost $16.99 on the Rainbow Loom website. P.S. 107 PTA president Alyse Dosik said she agreed with the ban, but noted that the bracelets have become woven into the fabric of the school. Students made thousands of the bracelets in school colors (blue and gold) for "P.S. 107 Day" on Oct. 7, and a Rainbow Loom table was a draw at the recent fall festival, along with face painting and a dunk tank. "The truth is, I love Rainbow Loom," Dosik said. "My kids love it. It's been a big thing."